Our very own Mr. Robert (Bob) Brush, Master Chief EOD, U.S. Navy (Ret.) and President, Point One USA, LLC to speak to attendees of the Global SOF Symposium in Madrid, on Thursday, 27 September on EOD Integration in SOF and its importance. Mr. Brush oversees all operations and management functions for Point One. Before transitioning to civilian service as a small business owner and operator, he retired from active duty in the US Navy as a Master Chief Petty Officer (MCPO) and Master Explosive Ordnance Disposal (EOD) Technician. His distinguished 22 year military career was committed to leading personnel and operations under and over water and on the ground to counter the threat of terrorism against the United States of America and her allies. He is an EOD subject matter expert who has over three decades of combined military and civilian service in the EOD and Joint Special Operations community; with over ten years of active duty at the Naval Special Warfare Development Group (NSWDG). He has extensive knowledge and operational experience both domestically and internationally to include; HME, CBRN, and WMD Operations and Defeat, Dismounted IED Defeat, Emergency Management, and Mine Counter Measures (MCM). 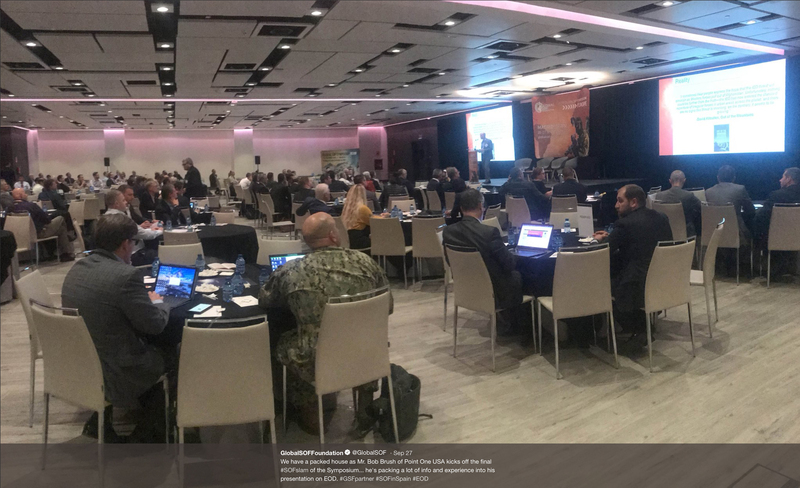 Attendees of the 2018 Global SOF Symposium event include active duty and retired military and police, government civilians, industry, academia, journalists, and non-governmental organizations from 30 countries. We are very proud of our leader and believe his audience will be most well-informed, encouraged, and inspired in advancing capability due to his speech. Bob, we wish you well for your speaking event and a great voyage overall for you and the Point One team! More on the event: https://www.globalsofsymposium.org/europe. Point One, a service-disabled veteran-owned small business headquartered in Virginia Beach, VA, is an industry leader that provides advanced training curriculums and equipment, exercise support, test and evaluation services and threat based training devices to support military and Law Enforcement professionals across the spectrum of operations.